Constitute! is a project of the International Women’s Rights Project. Constitute! 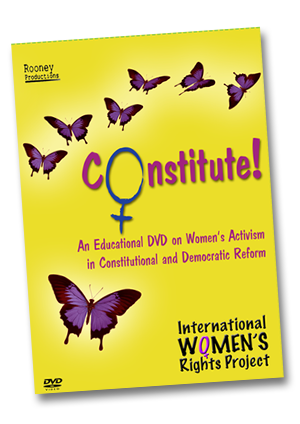 is a multi-media educational resource on citizen engagement and women’s constitutional activism. This website will allow you to view the film Constitute! as well as other interviews, and use the study guide and other educational resources in the classroom or for your own research. Constitute! profiles the diverse history of women's activism in constitution-making. The ad Hoc Committee of Women and the Constitution changed Canadian history on February 14, 1981. A celebration of constitutional activism and the passion for democratic renewal, Constitute! will educate high school and university students about citizen engagement in democracy in Canada and beyond. Interviews, speeches, songs and images of that Valentine's day in the parliament buildings in Ottawa are shown while the story is told by some of these same women 25 years later. The vibrant democratic activism by women from Afghanistan, Rwanda and South Africa is also portrayed. The anthropologist Margaret Mead said “Never doubt that a small group of thoughtful, committed citizens can change the world. Indeed, it is the only thing that ever has.” Constitute! shows how that can happen, how citizens can make history and positive social change.